Chocolate - one of life’s most decadent gifts! From chocolate Easter eggs to Christmas peppermint bark, chocolate is all around us and ever-tempting. But don’t fret! There is some chocolate you can enjoy guilt-free to your heart's content; whether it’s celebrating a birthday, nurturing a heartbreak or simply treating yourself to some good old fashioned soul nourishment, once you discover raw chocolate you will never go back! There seem to be endless possibilities with chocolate - you can sip a refreshing iced mocha with almond milk, eat a warm vegan chocolate cake, or make a homemade mole sauce for some veggie enchiladas! Chocolate can go both sweet and savory. No matter your preference, you can easily double your nutrient intake by switching to the raw, unprocessed version of chocolate. Not only does raw chocolate offer more antioxidants than acai and blueberries, which are crucial in fighting age-related diseases, you are also able to enjoy its decadence without having to sacrifice vitamins and minerals. Raw chocolate contains an abundance of vitamins including A, C, and E, as well as zinc, magnesium, calcium, iron, manganese, and potassium - all thanks to its base ingredient: raw cacao. It truly is the best of both worlds - nourishing your body while also nourishing your soul! You will love the simplicity of raw chocolate - eaten as nature intended without the inevitable stomach ache and sugar crash typically associated with a candy bar! While raw chocolate is a great treat to consume any time of day, you may especially benefit from having it in the morning. With its fatigue-fighting magnesium content and mood-boosting properties, you’ll be up and moving in no time! It’s also a perfect addition to your beauty routine as it promotes ageless, glowing skin due to an abundance of flavonoids; these promote cell regeneration by increasing blood flow to the skin’s surface. It also prevents tooth decay and aids in digestion thanks to its antibacterial agents and fiber content. Since health begins on the inside (your gut! ), be sure to treat yourself to some raw chocolate and relish in the benefits! While chocolate is usually celebrated for its role in desserts, and seen as a junk food because of it, many are starting to learn about its superfood-potential. Dark chocolate has gained a lot of attention in past years as a “healthy chocolate”, but raw chocolate outshines regular dark chocolate every time since the nutritional properties haven’t been degraded with heat. It can even improve cardiovascular health, blood pressure, and mood. It sounds almost too good to be true! The next time you find yourself studying for a big test or cramming for a work presentation, try some raw chocolate instead of coffee. Flavanols in the chocolate accumulate in the hippocampus and begin to generate new neurons while strengthening existing ones. This results in improved memory and learning capabilities, and as such, improved work. 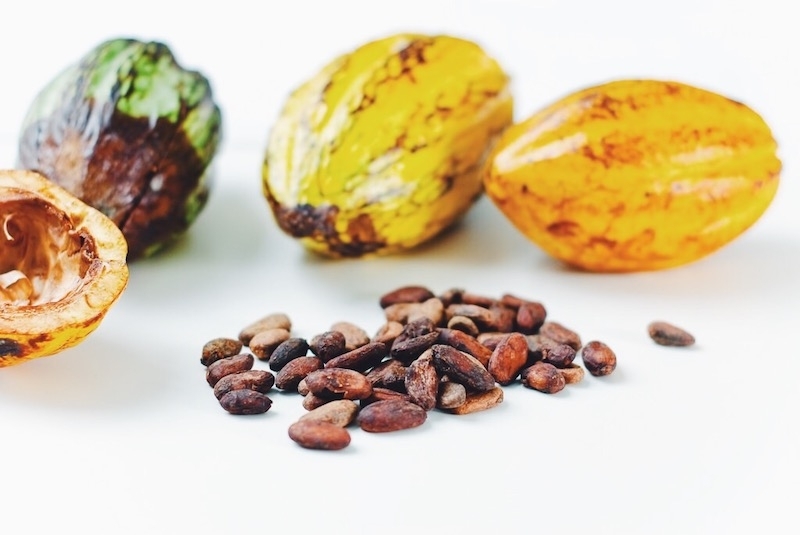 The process of creating chocolate from cacao begins with a manually-harvested cacao pod; the pods are split and the beans inside are collected to begin the fermentation and drying processes. Next, the beans are shipped to facilities and are then cracked to separate the shells from the beans. Broken cacao bean fragments are known as “nibs”. These nibs are typically roasted, ground and pressed to remove the cocoa butter and create what’s known as “cocoa powder”. Often the powder is treated with an alkalizing agent to remove bitter compounds. This powder can then be used to create chocolate. 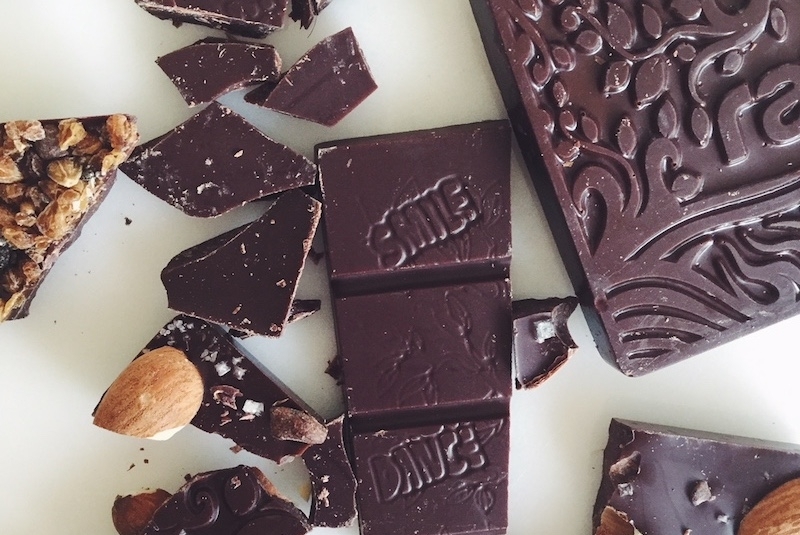 Raw chocolate differs as the cacao isn’t roasted, and is much less processed. Keep your eyes peeled for “nib to bar” or “bean to bar” chocolate that’s been stone ground at low temperatures - as this means the chocolate is made from actual whole, raw cacao - not processed powders. Also unlike conventional chocolate, raw chocolate typically does not contain harmful ingredients such as dairy and processed sugar--the real reason chocolate is in the candy section and not the health section. A great way to incorporate more raw chocolate into your diet is by adding raw cacao powder to your favorite smoothie, making a superfood hot (warm!) chocolate, snacking on some raw cacao nibs (they are a great garnish for smoothies or addition to trail mixes!) or simply enjoying a tasty 85% dark raw chocolate bar.